(a) Install the rear axle beam damper to the rear axle beam assembly. (a) Align the matchmarks on the axle beam assembly with the 2 notches of a new bushing and temporarily install the bushing to the rear axle beam assembly. 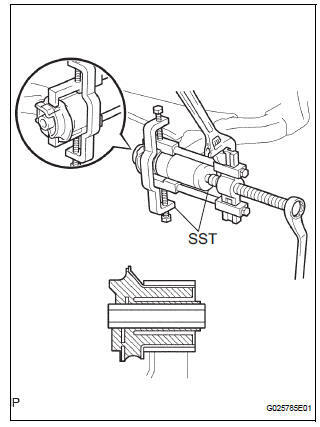 (b) Using SST, install the bushing to the axle beam. Hang the claw of SST to the bushing securely. Do not scratch the rubber portion of the bushing. Do not deform the bushing rib. (b) Install the rear axle beam assembly, 2 bolts and temporary tighten the 2 nuts. (a) Install the 2 rear axle bearing retainer inner LH and parking brake plate sub-assembly LH. (a) 2WD DRIVE TYPE: Install the 2 rear axle bearing retainer inner LH and parking brake plate subassembly LH to the rear axle beam assembly. (b) 4WD DRIVE TYPE: Install the rear axle bearing retainer outer and parking brake plate sub-assembly LH to the rear axle beam assembly. 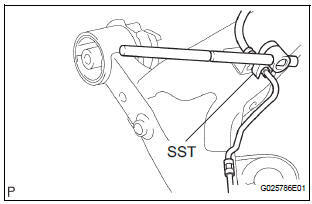 (a) Install the 2 bolts and rear disc brake caliper assembly LH to the rear axle beam assembly. HINT: (See page SP-38) HINT: Connect the RH side by the same procedures as the LH side. HINT: Fully tighten the RH side by the same procedures as the LH side.